The Internet Archive has all four of my dad’s college yearbooks digitized and available for viewing on line. 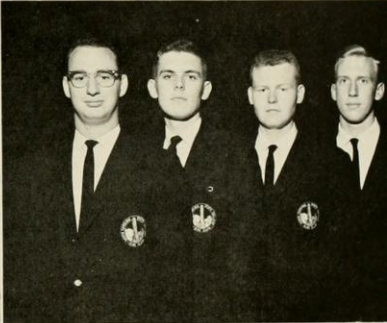 The N.C. State Agromech of 1959, 1960, 1961, and 1962 may not make for the most engrossing reading, but they definitely have the best blackmail photos. A special bonus for me was seeing my Dad’s four yearbook “headshots.” It’s amazing how much the 1959 Olin looks like photos of his brother from the same era, and how much the 1962 one looks like the dad I remember from ten years later. NICE. Totally right about the sequence of headshots, too.